Haha this upcoming girl is too hilarious xD! Meet the February 2014 doll named, Neo Blythe Lorshek Molseh. 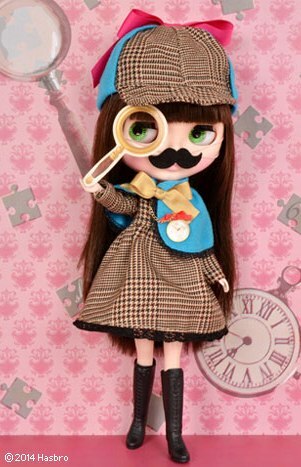 Her inspiration comes from the well known detective, Sherlock Holmes. Add this detective to your home! Lorshek will come equip with her handy magnifying glass, pipe, and a gorgeous antique pocket watch. That mustache, where to begin . . . too amusing! ^^ Luckily it's removable. I love the lace detail on the bottom of her dress and the vibrant pink bow on top of her head! Solving a crime is difficult. There are many cryptic clues and everything fits together like one big puzzle. Lorshek hunts around to find the answer with her cute mustache disguise. The truth will be revealed, it was a poison!